I came across this complicated looking but simple paper structure and have been happily playing around with it for days. I’ve been able to locate only once source for these, which is at http://hattifant.com/triskele-paper-globes-flower-edition/, an exquisite site by German artist Manja Burton. Fact is, her site has enough about these globes that, really, no one else needs to ever write about them again ever, but, oh well, here I go. Manja calls these Triskele Globes. 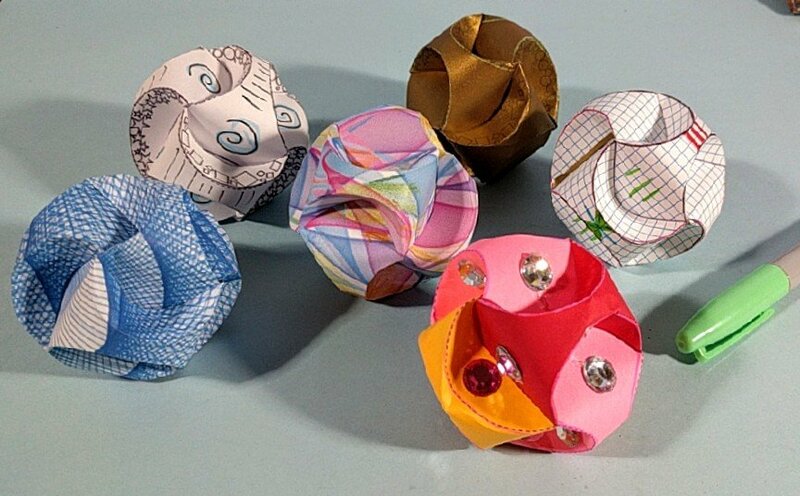 I have no idea whether these are a traditional paper-folding design, or if she developed it herself. “Triskele” is a symbol which depicts three interlocking spirals. 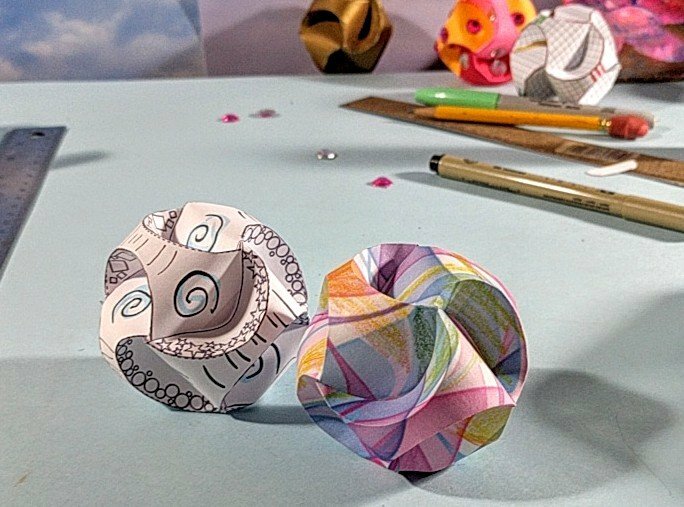 These paper globes appear to be interlocking spirals, but the spiraling is simply a wonderful illusion. Bonus Update: just as I was about to hit the Publish button for this post, I received a note from Manja, responding to my questions about this structure. I’ve added her response at the end of the post. The globes are made with three interlocking strips. I made three different pdfs for paper strips, which will be at the bottom of this post. Each page will make two ornaments. My templates are a bit smaller than the ones on Manja Burton’s site. I like this smaller size mostly because I think it work so well with standard copy paper. I’ve embellished with the paper with simple shapes, so that it’s easier to distinguish the strips from each other, otherwise it can be confusing to see what’s going on with the construction. I’ve also provided a pdf below that has no embellishments, so my shapes won’t interfere with your own vision. You’ll notice that there are triangles on the template. These triangles are hidden in the final product. 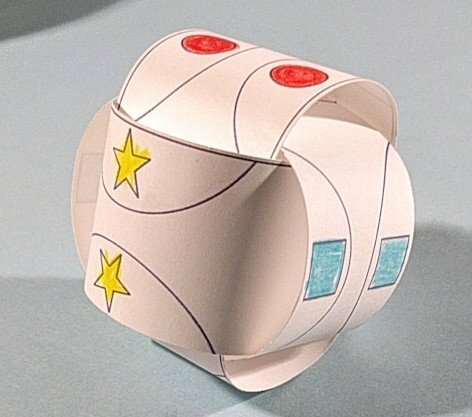 I put them there to help orient the designs, hopefully making it easier to see how the rings of paper strips are aligned to each other. If you don’t have access to a copy machine, it’s absolutely possible to construct your own template for these paper strips. 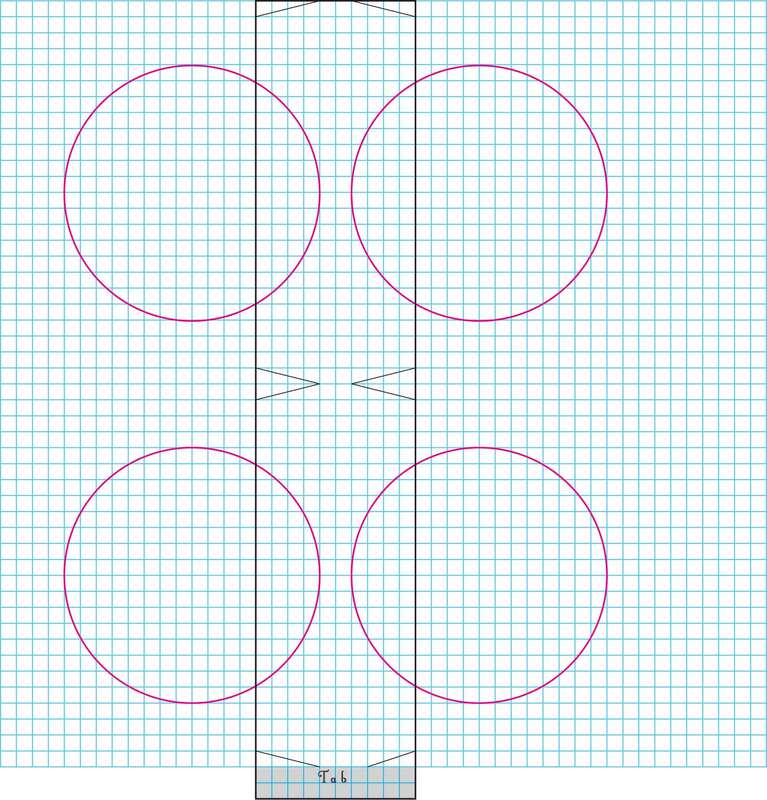 Here’s a grid that can be used to understand the proportions of the shapes. 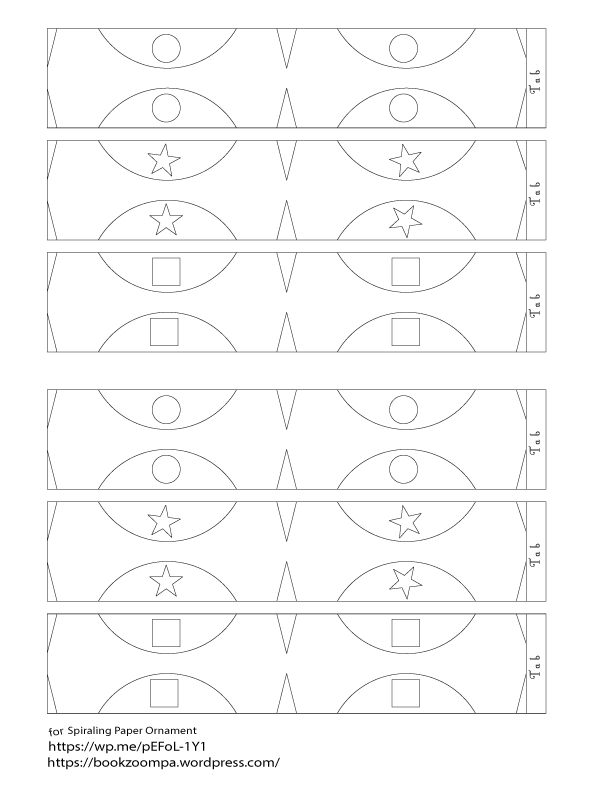 The paper strips for the Spiraling ornament, mapped on a grid. 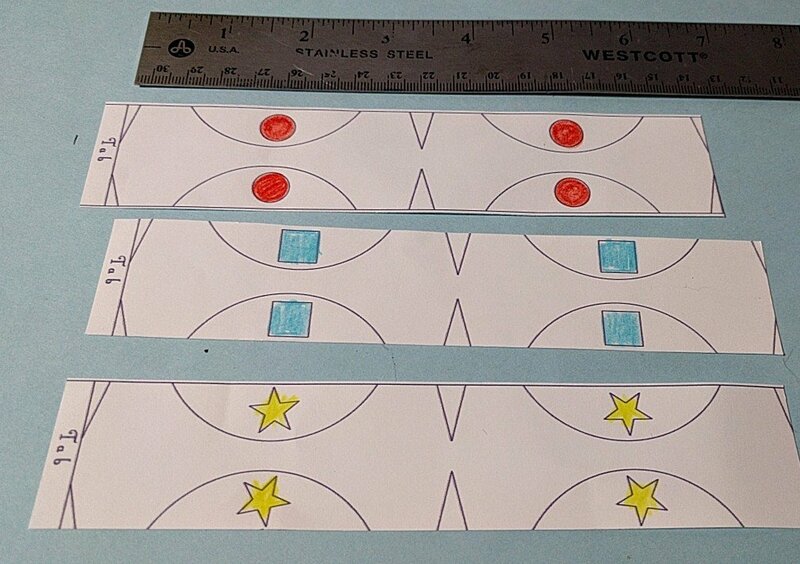 The strips are 48 squares tall (plus two more for the tab), 10 square wide, and the circles have an a radius of 8 squares, but only 1/3 of the circle is on the paper strip. There, that should get you started. 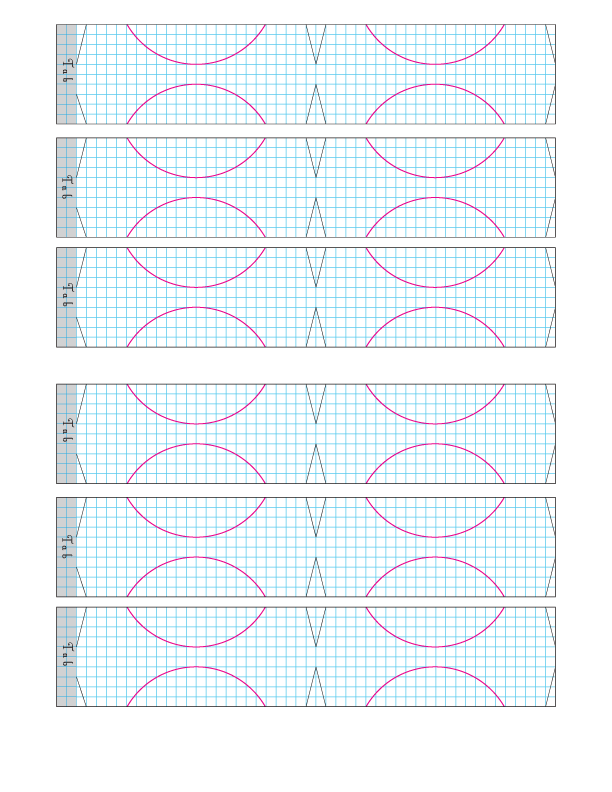 I liked the look of the grid so much that I made a PDF of templates that includes the grid. I’ve had such a great time with these. I’m surprised every time I see the transformation happen as the strips of paper become a spiraling globe. Here are the PDF’s of the strips. Have fun. Use bling. Be colorful. Experiment with different papers, different designs. Make them into dice, fortune tellers, add quotes. Go wild. Here’s the bonus update: I wrote a note to Manja which said. Manja, I am enchanted by the Triskele balls, and am currently writing a blog post about them, which will include links to your site. Can you tell me something about history of these balls? did you invent the form or did you come across it in your travels? Many thanks for your beautiful work. Okay! If anyone knows something about the history of these balls, let us know! Then this friend, who I know only by the name Loop Space wrote a great post for the mathematically curious which is https://loopspace.mathforge.org/CountingOnMyFingers/Triskele/. I especially like how Loop Space illustrated the explanation. Previous Post Weblog Birthday, 8 years old! where you can buy pre=printed kits. The designer is listed as Vivi Gade, but I suspect that is design of the surface patterns, not the original structure. Manja had mentioned click ornaments…when I searched for that last night I came up empty. Great that you found this. I just wrote ot a Scandinavian antiques dealer,, asking him if he has any idea about them. This intrigue and searching is wonderful. This is great fun! I will re-blog this post and perhaps someone else can add information. Paula has (as usual!) 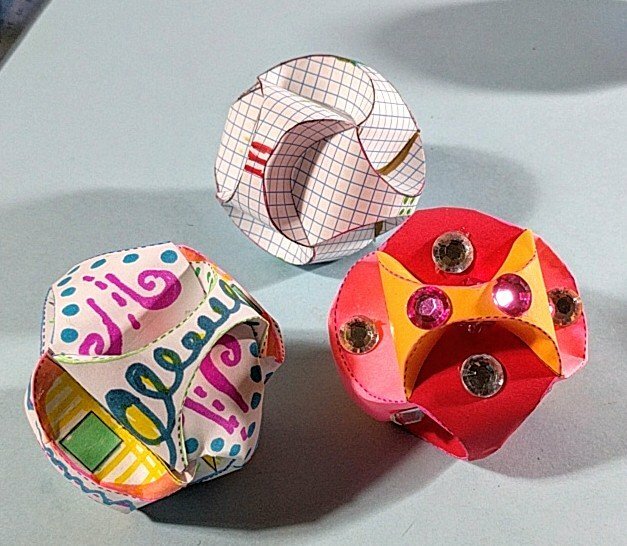 an interesting paper construction.If anyone out there has more information, feel free to jump in.And, if you make one, please come back with a link. This looks like a paper version of something an uncle carved back in the 1960s. He lived in upper Alabama, USA and carved 3 rings like above all from one block of wood. No clue where he got the design from.